Fix-It Utilities Professional 10 ($50, 14-day free trial) is an all-in-one tune-up and security tool that does everything from protecting your PC from viruses with built-in anti-malware, to repairing your Registry, performing hardware diagnostics, recovering lost photos, and more. Fix-It Utilities Professional 10 is a useful fix-it tool, although it sometimes fixes problems before reporting to you about what it finds. Like similar tools, Fix-It Utilities combines in a single interface many different categories of different tasks, and then has a number of separate modules within each category. For example, in the Fix & Maintain section, you'll find tools for fixing your Registry, editing the Registry, diagnosing and fixing hard disk problems, updating Windows, scheduling Fix-It tasks and synchronizing your system's clock. Other modules have a similar depth of features. 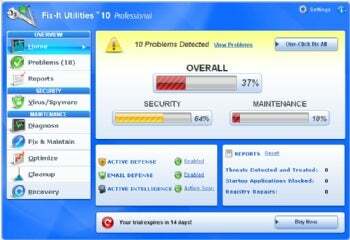 For its anti-malware features, Fix-It Utilities Professional 10 uses VIPRE Anti-virus from Sunbelt Software. VIPRE's anti-spyware/anti-virus engine uses a combination of heuristics and anti-spyware and anti-malware definitions. PCWorld did not perform lab tests on it, and so cannot gauge the effectiveness or reliability of the anti-malware component. One issue I have with Fix-It Utilities Professional 10 is that in some modules it will fix problems it finds without first asking whether you want them fixed. For instance, it does this in the Registry fixer--although in the case of that module, you can easily change a setting so that it asks before making changes. In some modules, however, it's not too easy to find this option. Most other similar tools first do a scan, and then ask if you want the problem fixed. In addition, after you install it, the program always runs with no apparent way to turn it off. It also includes occasionally intrusive nag screens. There are plenty of similar programs available, and most of them sell for the same price as Fix-It Utilities Professional 10. Which you prefer will likely be a personal preference. I prefer Ashampoo WinOptimizer 7 because it has a cleaner-looking interface, and is better organized. In addition, the Ashampoo product doesn't fix problems unless you tell it to do so.